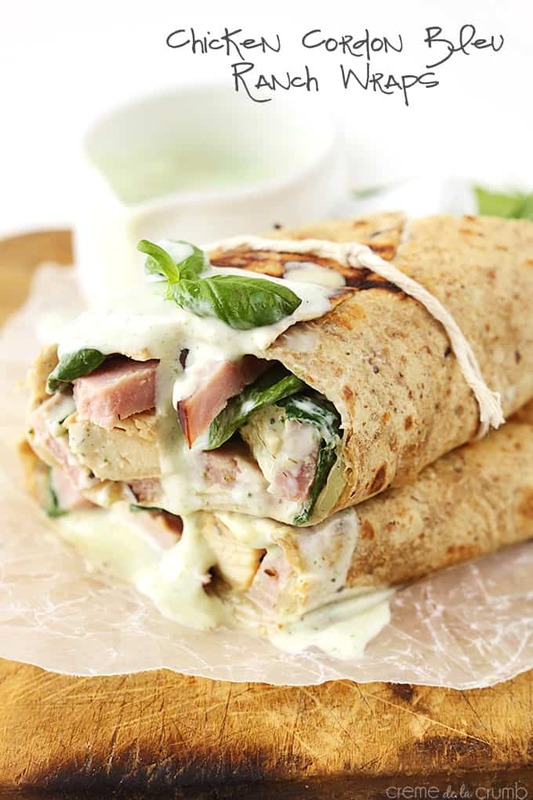 Chicken Cordon Bleu Ranch Wraps – An easy and healthy new take on classic cordon bleu – ready in 30 minutes and the whole family will love it! You guys. Do you know how hard it is to take a decent picture of stuff wrapped in a tortilla? It’s hard. I kind of hate these pictures. Passionately. But these Chicken Cordon Bleu Wraps? Too good not to share. 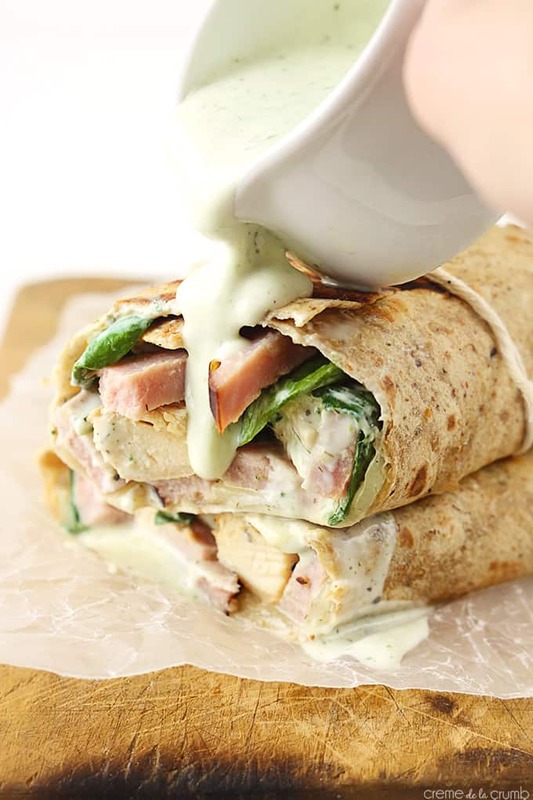 So just close your eyes and imagine what it would be like if you turned a classic chicken cordon bleu into an easy and crazy delicious wrap-version. Beautiful isn’t it? I’m sharing a “zesty ranch dressing” with this recipe below but you don’t have to use if you’re not feelin it. But if you have the stuff? Make it. It’ll take you five seconds and it’s seven-point-two million times better than the bottled kind. And please take that tiny extra step to grill up the wraps. That little bit of crunch just takes it all to the next level of wonderful. But, if you’re havin’ a lazy day (I have em all the time, no worries) then just pop em in the microwave to melt that cheese. See? Easy peasy dinner done in 30 minutes that everyone will love. Can’t beat that! An easy and healthy new take on classic cordon bleu - ready in 30 minutes and the whole family will love it! Season chicken with salt, pepper, and garlic powder. Cook over medium heat in a large nonstick pan or skillet sprayed with cooking spray. Slice cooked chicken into thin strips. If using above recipe for Zesty Ranch Dressing: add all ingredients to a blender. Pulse 30-60 seconds until smooth and creamy. Cover and chill until ready to use. Lay out each wrap on a flat surface. Place 2 slices of provolone cheese on each wrap. 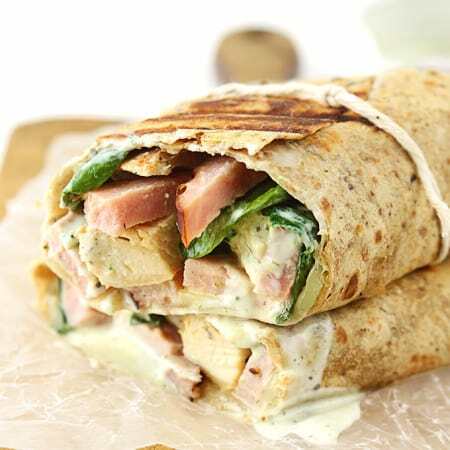 top with spinach, then chicken and ham strips. Drizzle 2-3 tablespoons zesty ranch dressing (or preferred ranch dressing) over wrap fillings. Carefully roll wrap. Recipe adapted from The Best Blog Recipes. Your pics look great! I soo want one of these wraps for lunch today! !